In black jack, most bad ideas can be eliminated by simply learning the basic black jack strategy charts. This is an article about the strategies that some players use, but which, instead of giving better odds of winning, are in fact making you lose more money in the long run. A strategy to avoid is copying the black jack dealer’s moves. The dealer’s strategy is dictated by a casino rules standard and very simple: he will stand on 17 or higher and hits when he gets less than that. It is far from the optimal strategy (which is in fact the basic strategy) and you shouldn’t think that you would get the same odds as the dealers, because you go first and the dealer will go after you, only if you didn’t busted. 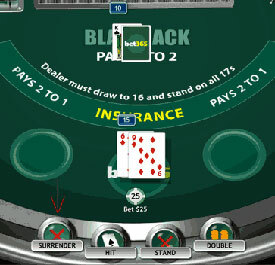 Another thing to avoid when you play black jack is taking insurance. 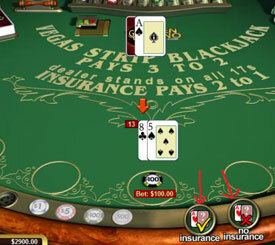 Insurance can be chosen when the dealer shows an ace, it costs half of the original bet and it means that the player would get the original bet back if the dealer would hit black jack. However, blackjack insurance gives you awful odds. There are four cards out of the 13 that can give him blackjack, so the odds that he has blackjack are 4:13, or 30%, basically, it’s more likely (70% of the time) he doesn’t have black jack. Some players believe that surrender is always a bad idea. This refusal of surrendering perhaps stems from the macho gambling attitude of some men, who think that surrender is a cowardly thing to do, while others think it’s a trick made by the casinos to dupe amateur gamblers. In fact, surrender, can be in your favor, if used wisely. Surrendering means that you will lose half of your bet, but you will get back the other half. This can be used in your favor when your hand is bad enough that on average, you would win not even half of your bet back. Statistically, it’s better that you use surrender when the dealer’s up-card is 10 and you have 10-5, 9-6, 10-6 or 9-7, or, when the dealer’s card is 9 or ace, you should be using it if you have 10-6 or 9-7. For more strategy on what to do and what not to do while playing blackjack, you should check out HowToGamble.net by clicking here. Overall, in black jack online, the best possible odds you will get following the standard “basic strategy” and not relying on various superstitious strategies from other players.